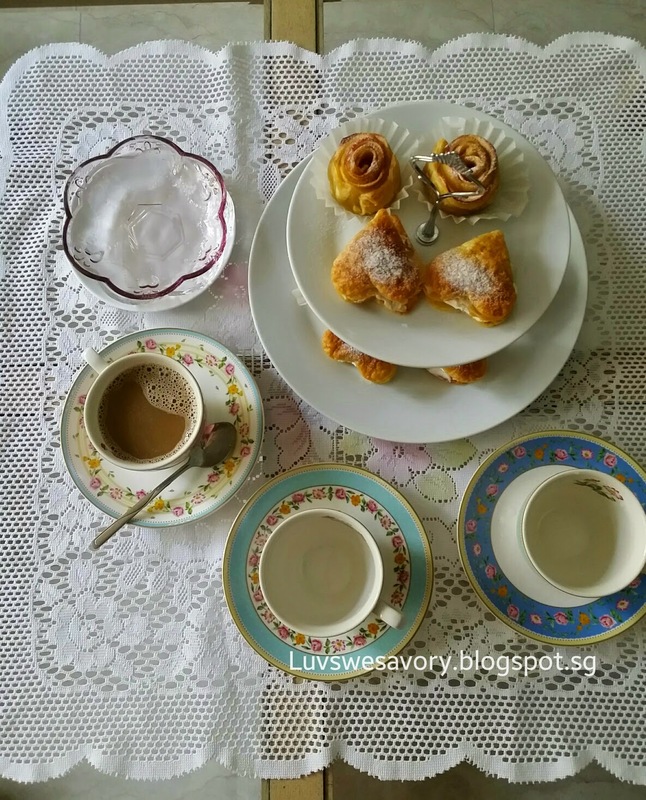 Pastries are so versatile that they can be served as breakfast, afternoon snacks or desserts. My parents in-law popped in for a visit and a weekend stay-over with us. 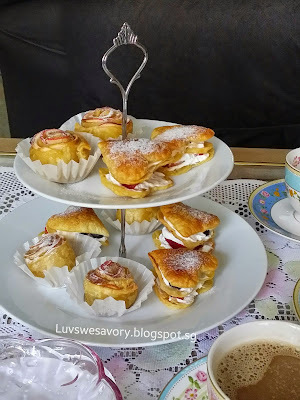 Since I've a pack of store bought frozen puff pastry sheets, why not make some pastries for our tea/coffee break. Well, I've got some apples, strawberries, blueberries and whipped cream .... how about Mille-Feuille ! Yes ! ... and some lovely Apple Rose Tarts ^-^! 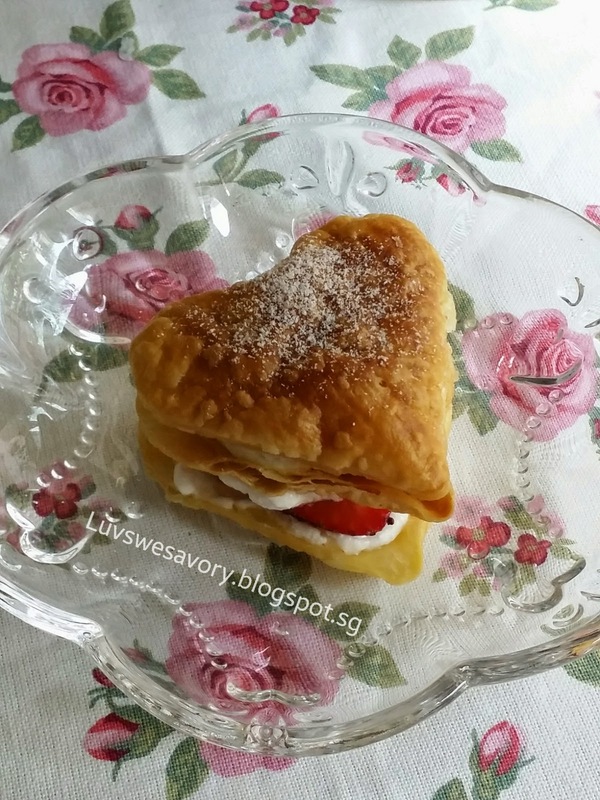 Made a few mini heart-shaped Mille-Feuille or commonly referred as Napoleans. Used whipped cream with some strawberries and blueberries for the fillings. Since I'm using the ready frozen puff pastry, below my slight modification made. 1. Cored and slice the apple thinly. Put in the pot with sugar, honey and water and cook for about 3 to 4 minutes till softened. Drained and cool the apple slices. 3. Thaw the puff pastry sheet on the lightly floured surface. 4. Cut into 6 strips. 5. Place about 6 - 8 apples slices on each strip. Roll from one end to the other. Place them individually in cupcake cases. 7. Lightly brush with honey and dust some icing sugar and ground cinnamon. Tada! ... Here's some lovely sweet pastries for our tea/coffee break. Enjoy ! Surely LY, hope one day we shall have tea together ^-^! 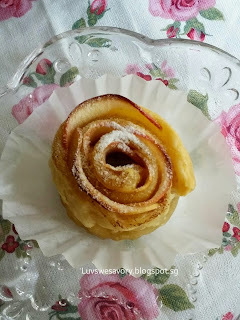 The apple rose tarts look so pretty! Anything with puff pastry is surely delicious, love the flaky layers! Thanks. Think I shall choose a dark red apple next time for a more contrast colour. Karen, you are so clever! The apple rose tarts are very pretty. I bet they are yummy too and not forgetting the heart shaped Napoleans! Thank you Phong Hong. Indeed my MIL claimed pretty & yummy. 1st time that she tried the pastries I made. Your parents in-law are so lucky to have such a good daughter in-law who keen to bake this super lovely apple tarts to welcome them. I think they must be very enjoy with the tea break. Glad that they enjoyed these sweet treats. Hi Karen, I love those rose tarts. 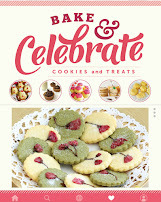 Must find a day to bake this too. Yes Cecilia, it's pretty easy and nothing beats to "admire" the lovely roses before enjoy with them ^-^! 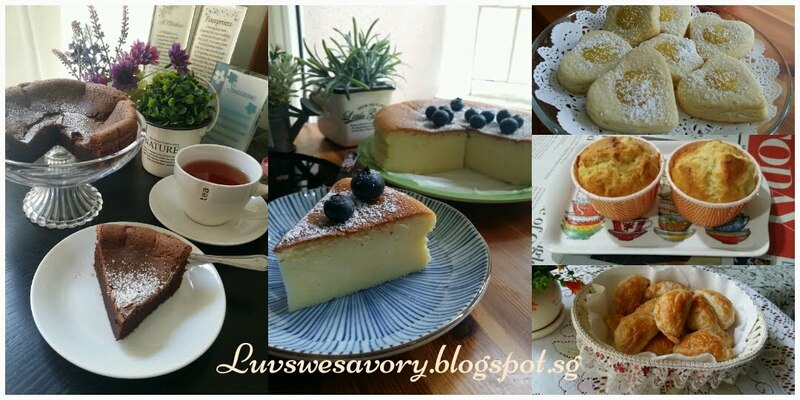 Pretty and cute pastries. Looking so good and tasty especially with a piping hot cup of coffee..
Agree with you Nancy. Hmm ... wish you could join me for coffee too ^-^! Lovely pastry you have gotten here Karen..some how they reminded me of tos apple strudels and we won't mind to have some of your lovely strawberries pastries..yummy! Thank you. Oh yes apple strudels ... 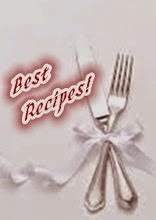 I must learn to bake apple strudel one day ^-^! 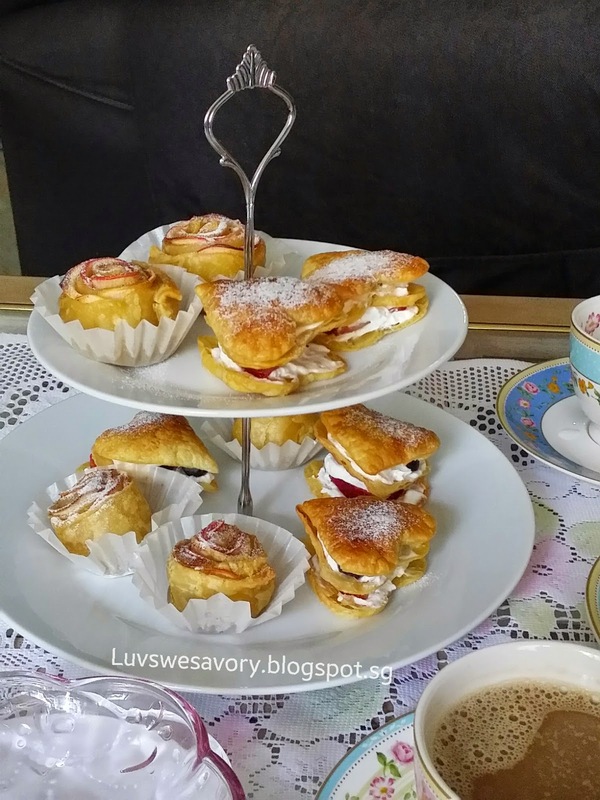 Oh！Karen, your mini Napoleans & Apple Rose Tarts both are look cute and pretty! Many thumb up for you! Hee hee ... next time ok ?! 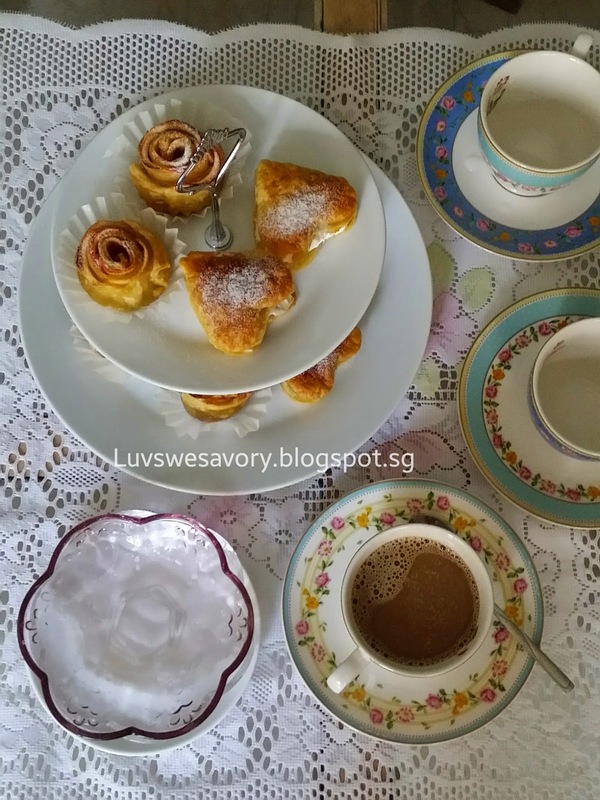 These apple rose tarts are so lovely.